The humble quotation is often the beginning of long and fruitful business relationships. But the creation of quotes can often be a somewhat arduous task – especially without the right tools. With the AutoVu platform, you'll have access to AutoQuote – and it might just change the way you create quotes forever. Sometimes a well-crafted quote can mean the difference between a successful sales process and a failure, but many businesses simply don’t have the time to create something that really stands out. This is one of the reasons that we created the AutoQuote feature that you’ll find built right into the AutoVu CRM & FSM platform. Designed to be as simple or as complex as you need it to be, you’ll find it’s never been easier to create in-depth quotes that really work. Let’s take a look at AutoQuote in a little more detail. The AutoVu platform was built to cater to every stage of the sales process; so much so, in fact, that an entire module is dedicated to Sales Prospects. It’s this area of the platform that forms the basis of the powerful AutoQuote feature. It’s fully integrated with the rest of the AutoVu system and its data, meaning it can pull information like products, services, pricing, and prospect contact information in a matter of seconds. With all of this data to hand, AutoQuote is able to produce beautiful quotations tailored to your branding with just a few clicks. In a nutshell, you can tell the system exactly which products or services the prospect is interested in (choosing from a table of pre-existing items), add a warranty if required, pick from some custom text fields and voila! Your quote is ready to send. Of course, the AutoQuote feature wouldn’t be complete if it didn't allow for a full host of customisation options. With this in mind, we’ve built the feature with the ability to be totally flexible – especially when it comes to templating. We understand that your business will have a variety of different customer types, pricing structures, services, and more. That’s why AutoQuote allows you to swap between all of these options at the touch of a button. 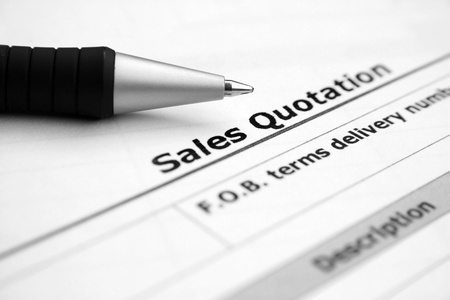 Need to switch pricing structures while preparing a new quotation? Not a problem. Likewise, you’re able to fully customise the look and feel of the quotations at any time. And because AutoQuote sources its detail from your existing customer and prospect data, there’s no need to do any extraneous data entry – it’s all there for you from the start. Once you’ve used AutoQuote to create a beautiful quotation for your prospect, the AutoVu platform’s usefulness doesn’t end there. You’ll be able to export any of your quotations in PDF form, use built-in mail-merge functionality to prepare it for sending by post, or send it via email right away. Because the AutoVu platform is designed to give you complete oversight of your company, you’ll be able to view all of your pending quotations anytime – and make any changes via AutoQuote whenever you need to. You can use the grid system to sort the data by date, status, value, and more. It’s all part and parcel of the way AutoVu makes managing your sales funnel easier than ever before. Would you like to know more about how AutoQuote can help your business reach more customers and boost sales? Explore the site today to learn more, or call our friendly team on 0845 474 8824.